SG Haulage Ltd. understands the needs of our customers. The cargo we carry is as diverse as those needs, so we strive to provide great service and to transport your goods or cargo safely. 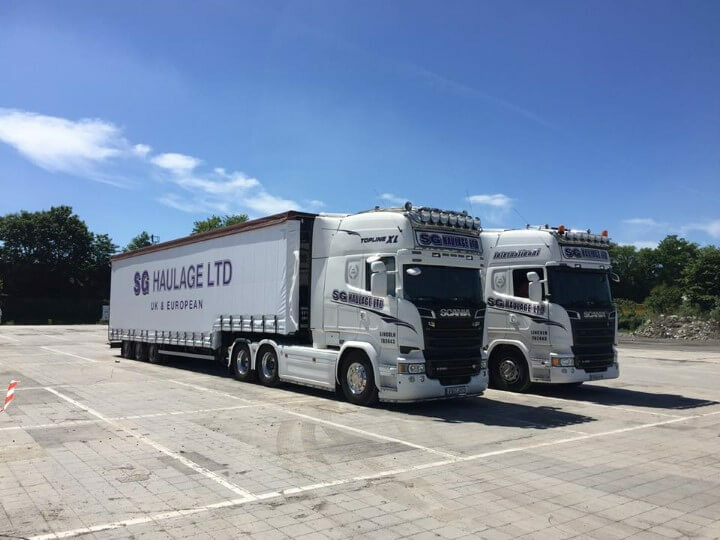 Our fleet is constantly growing and being improved so you can access bigger and better secure road haulage from Lincoln, Nottingham, Grantham, and surrounding areas. We believe that safety is the foundation of reliability, and our team are CPCS, NPORS and ALLMI-accredited. These accreditations, combined with our 25 years’ of experience, allows us to safely and efficiently move your heavy, abnormal, specialised, and sensitive loads across the United Kingdom and Europe. As well as our many accreditations, SG Haulage Ltd. is also a member of the Road Haulage Association (RHA). This is the organisation which sets the UK standards for haulage companies. We recently attained FORS (Fleet Operator Recognition Scheme) bronze level from Transport for London. FORS is a voluntary scheme which promotes good practice for all commercial vehicle operators. It covers all aspects of safety, efficiency, and also environmental aspects. These measures means that our Lincoln road haulage company continue to constantly improve our services to ensure our customers are satisfied. We also use ESDAL (Electronic Service Delivery for Abnormal Loads) to both plot all our routes when transporting heavy or abnormal loads, and to liaise with the relevant authorities in each area we pass through. We’re proud to have attained bronze level of the Fleet Operator Recognition Scheme. This means we have complied with standards set for lawfulness, safety, efficiency, and environmental protection. The audits are made through Transport For London. We share best practice with others in the scheme to provide you with a professional haulage delivery service using the most trusted methods. SG Haulage specialises in all aspects of road haulage, with the latest additions to the fleet being self-loading Moffett forklifts. These have a max mast reach of 4 metres and can lift 2.8 tonnes. The Moffetts are all wheel steering, making tight access a piece of cake! They are also adaptable to flat trailers and curtainsiders, making them particularly suitable for equestrian and festival events. Another of our specialties is international haulage, reliably getting your goods across the continent in no time at all. To find out more, visit the international haulage page now. Our Lincoln road haulage firm also offers crane hire throughout the UK. After a quarter of a century in the haulage business, we have built a fleet of diverse vehicles which can provide a variety of unique crane services. With crane operations, safety is of course paramount. All our crane drivers/operators are CPCS, CSCS and ALLMI registered. SG Haulage’s Slinger Banksmen are also CPCS and NPORS qualified. We are the company to trust in finding you the perfect crane or HIAB hire for your project. Call us today to discuss your needs and ask for a quote on 01522 702 443.